INSIDE THE WRITING IN GAMES | From League of Legends to Tomb Raider, we dive into how games writing has evolved in the modern age and the people behind it. This is Part One of a three-part series exploring writers across video games. Since the start of the year, we've spoken to over a dozen writers of varied disciplines to learn the ins and outs of what it's like to write for video games in the modern era. Contrary to what the hype machine of the industry or auteur theory may lead the average person to believe, there is almost never a single mind behind a video game. There are more than just the big developers, the well-known publishers, the prestigious creative directors with their names emblazoned at the end credits (sometimes of every mission). Oftentimes, the people that create everything in between all that fall through the cracks in the eyes of the typical player. Games are made by teams big and small, made up of designers, programmers, artists, and long storied to be among most shunned of all: writers. But that mindset's changing. In the past decade, we've seen the likes of Naughty Dog shift away from cartoonish platformers; we've seen once-macho action titles adopt a serious-minded edge to tell a story about the perils of fatherhood; we've seen independent visual novels about growing up queer become unexpected hits. Games are being nominated for prestigious awards for their writing, which even a decade ago was almost unheard of. 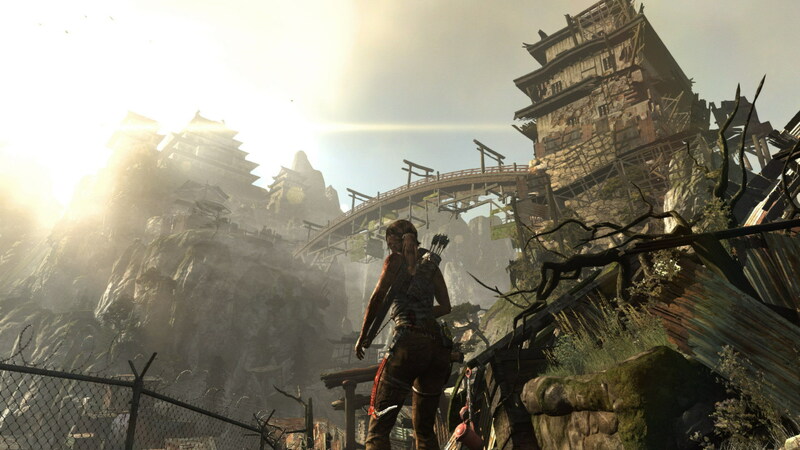 The Tomb Raider reboot, released in 2013, introduces a grittier Lara Croft. Over the past six months, I've spoken to these underappreciated, often unsung writers. The off-site writers working per contract, helping sculpt massive games from within a big (or surprisingly not so big) team. The writers crafting NPC dialogue and weapon descriptions. The indie developers who are left to weather every aspect of writing and designing almost all on their own. The triple-A writers lucky enough to be brought into games from the start, against the once-norm. The prevailing sentiment I've discovered is that while writing in games has grown over the years, it's become more diverse, more ambitious, and in some ways, more welcoming—even with crunch and narrative paramedic gigs glaring at the end of the tunnel. Once upon a time, writing for games used to be like the Wild West, or at least that's what Tomb Raider and Mirror's Edge writer Rhianna Pratchett compares it to. There wasn't a standard, expected way to write games. And hell, there still isn't. "The gameplay designers usually have more power than the writers do unless the writer is also the game director or the creative director. You know your Ken Levines, your Neil Druckmanns, your Amy Hennigs. They generally have more power to say what goes than someone like me who works off-site," Pratchett tells me over Skype. "But the collaboration is a lot of fun. It's the people around you that really make or break the experience, and particularly with the Tomb Raider games and the Overlord games. They're really really great teams, and I feel blessed for being able to work with such great people." It's common for writers in the games space to have started their careers in other writing fields. Narrative director Bill Harms and senior writer Ed Fowler of Hangar 13 worked in both comics and television writing, respectively. The latter in particular is sometimes a collaborative effort similar to blockbuster video games, while the former is an exercise in writing succinctly. Will Porter, a writer on No Man's Sky (at launch) and Alien: Isolation, credits himself as a former games journalist from his time as a freelancer and at PC Zone, as does his peer Pratchett. Games writers' careers are often varied, which lends to games' multidisciplinary nature. Pratchett sees a parallel of the changing faces of games writing from her former profession too. "I think you don't get into writing, the writing gets into you," Pratchett says. "I had a wealth of PC gaming experience and I think that was a little bit of a rarity for young women at the time. There weren't that many female voices in games journalism back then. So I think that made me a little bit of a rare unicorn I guess. Not as much these days luckily, but I used to do creative sort of bits and pieces of creative writing at school. I enjoyed writing but I was so hesitant at it. Obviously my father [late fantasy author Terry Pratchett] was a writer. There's a part of me that thinks that 'Why can't I have just been a great musician like my grandmother?' [...] But I think that this sort of writing found me and I really enjoyed the journalism but I think it was important for me to create and to find somewhere creating." Like so many others I've spoken to over the months, no matter what thing they once wrote for, they all ended up in the same place: writing for video games. A portion of League of Legends' Universe hub. With technology that evolves as often as video games, the writers behind them have had to be on their toes to adapt. Among them are legendary role-playing game creators, independent game developers, a multiplayer juggernaut, and everything in between. In the wild frontier, finessing on an uncharted territory has become essential; whether it's happened by accident or necessity. The Dragon Quest series, which began long ago in 1986, got its start making its characters one of the biggest draws. It's reflected in Japanese RPGs as a whole beyond the series too—JRPGs are often character-driven rather than plot driven. Yuji Horii, the creator of the Dragon Quest series, paved the way for the genre's long history. Arguably, Horii helped break away from video games' earliest storytelling conventions. Dragon Quest effectively blazed a new way to tell game stories, period: through characters, and characters alone. "The fact there's no direct narration at all and the whole story is told through the dialogue of the characters, I think that's what makes Dragon Quest special," says Horii. "That's been our policy since [the first] Dragon Quest: the whole story has to be told through character dialogue alone. I think spoken dialogue is the easiest text to read." 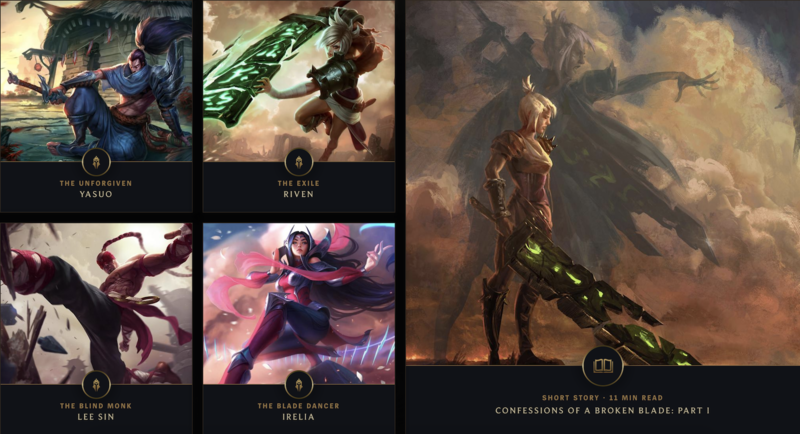 Riot Games, in particular, pretty much wrote the blueprint on how ongoing multiplayer games flesh out their larger narratives—in short stories, character biographies, music videos, animated shorts, and so on. Games like Blizzard's Overwatch have followed its model over the years too. League of Legends is one of the biggest games in the world, and even if it is a MOBA, that's never stopped it from having storytelling. It just invented its own brand of it. The focus, at least in the formative years of League of Legends' development, was never to build a cohesive narrative though, at least not according to lead narrative writer Ariel Lawrence. For Lawrence and lead narrative editor Laurie Goulding at Riot Games, the ongoing goal for the writing team is to connect players with the evergrowing cast of characters in League of Legends. To provide depth to them, and to give players even more reasons to love them. And most importantly: to write a good story. Striking that balance for a MOBA with story never getting in the way of the heavily tactical gameplay is a tricky task. Yet it's a necessary one, as narrative, believe it or not, often helps sustain long-term engagement. It’s what keeps fandoms thriving (whether they're penning fan fiction or drawing fanart), even for the sorts of games where one might not think of storytelling as the first and foremost draw. This also leans into the diversity of Riot's lore-driven projects. "A three minute CG animation shows our characters and world at a different level of detail than a ten thousand word short story or a comic, or 600-word biography on Universe," writes Lawrence. "Each piece is meant to do something different and can show how characters see themselves in addition to how we, as an audience, see them." Expanding the lore is only natural for a game of League’s magnitude: in scope, characters, and popularity. Just look at the likes of Marvel's massive Cinematic Universe, Star Wars' annual films, and any other property that Disney has in its clutches. There's a reason why League has remained one of the most-played games in the world even after nearly a decade. Riot is dedicated to not just the game itself, but the entire universe surrounding it. That includes helping sustain that very world through writing beyond the game itself. "When I started working in games almost fifteen years ago, story in a video game was basically just mimicking the linear narrative of movies. This is great when you wanted to make an immersive 12 to 18 hour game like God of War, which I worked on, but Riot’s approach was to make a bunch of interesting characters based on familiar archetypes to get as many people interested in playing as possible," says Lawrence. “Unlike most linear narrative video games, League of Legends is a game that has been in active, continuous development for over ten years. As players got attached to those characters, they naturally began to crave story around them. Like design and art, narrative is something that Riot has learned to iterate on." Arielle Grimes, an independent developer who now works as a game designer at Capybara Games (of Superbrothers: Sword and Sworcery EP and Below fame), is one of many who helped pioneer the modern lineage of introspective altgames that usually find a home on itch.io, rather than Steam. Her games, from the experimental visual novel-y BrokenFolx to the glitchy-vignette of What Now?, exemplify independent writing in games at its most raw—when it blends with its interactivity and can't stand alone without it. "The writing approach, for me it was mostly like diary influenced," she tells me. She's quick to add that she doesn't consider herself a writer in traditional terms. "You know like this space where you can throw everything in and not really worry too hard about like is this really the best way to structure this." The browser-based What Now? by Arielle Grimes was released in 2014. What Now? perhaps best shows off Grimes' focused design sensibility. In it you navigate an open space, bumping into mundane things like a bed where personal tidbits pop out of it. The longer you explore, the more the game glitches out. It's like anxiety is oozing out of its code. "I still think that [with What Now? ], like every element feeds into itself. [...] Like all the sprites, all the characters, all the interaction of everything you do, it all feeds into one specific goal and one specific like response," she explains. "It's just, there's not a lot of games that do that and I'm still super proud of it, proud of myself for being able to pull that together because it showcases a very cohesive experience." As a game designer, Grimes has done basically everything for her games. Programming, writing, audio design—all of which she wants to get back into. At Capybara, she's thankful for a collaborative work environment where she can pop into any meeting and feel like her feedback is not only heard, but welcomed too. There's a sense of freedom there that seems rare at game studios, especially for writers. For instance, Rhianna Pratchett highlights her work on the Overlord games because of her opportunity to co-direct the audio, something that wasn't quite welcomed on the bigger games she's worked on. Increasingly triple-A games are putting its storytelling at the forefront as another buzzword bullet point to lodge alongside "4K" and "steady 60fps" on a press release of its greatest attributes. Pratchett herself tells me she's seen the once tight-knit community, at least in the U.K., grow beyond the industry's once-lonely frontier. "I went to a game writers gathering that was organized by one of my U.K. colleagues and there was about 35 people who turned up in this room at the pub. It was kind of amazing because I remember when we first used to do these gatherings and there was three of us," says Pratchett. "And, it was just three of us. We really, the London-based game writers, we used to meet and celebrate our triumphs and tragedies. And it was kind of amazing to see how much it grew and how there are many more game writers around, there's much more focus. "I mean so much has changed because," she lets out a deep sigh. "It was like the Wild West when I started out. Like it was some barren landscape with these lone cowboys going across it and, you know, then you had the coming of the railroad and industrialization. And suddenly like there are buildings on the land, line posts, and rail tracks and people are paying attention to story and hiring writers and hiring narrative designers and like caring, and giving people awards for stories and making narrative summits for video game writers. It's kind of amazing to see because it's given me a great perspective on the kind of evolution which I think is really come on leaps and bounds since I started out. And yeah, it does make me feel quite old." Correction: We have amended the section on Dragon Quest, which misattributed a quote from Yuji Horii as from Koichi Nakamura. We regret the error. Reporting for Yuji Horii interview contributed by Nadia Oxford. Header art made by Caty McCarthy, including photo "Typewriter" by Takashi Hososhima, licensed under CC-by-SA-2.0. Stay tuned for Part Two on narrative paramedics and the bumpier side of development, featuring interviews with Hangar 13, Alien: Isolation and No Man's Sky (pre-patch) writer Will Porter, 80 Days writer Meg Jayanth, and more. Tagged with Arielle Grimes,	Feature,	league of legends,	Mirror's Edge,	Rhianna Pratchett,	Riot Games,	Writing in Games. Will Dragon Quest be the latest series confirmed for Smash?